If you are in the process of planning some vacation this month, make sure you set aside a few days for summer night observing. With the Milky Way in all its glory overhead as seen from the countryside, far from city light domes, you will want to stay up till the first sign of astronomical twilight begins. The observing window for this month in which the Moon will not interfere will last from August 8th to 16th with new Moon occurs on the 12th. As luck would have it, the night of August 12/13 also happen to be the peak of the annual Perseid meteor shower with the entire shower occurring from July 17th to August 24th. If skies are clear on peak night, you should be able to see a predicted 100 meteors per hour from 5:00 hrs to 7:30 hrs Universal Time (1:00 to 3:30 eastern). With the combination of vacation time, an absent Moon and a warm August night, this display should be witnessed by a lot of people. The comet’s dust deposit that lingers in space is a souvenir of the periodic Comet 109P/Swift-Tuttle. With a 130 year orbit, it last swung by the Sun in 1992 thus littering our part of the solar system with a fresh layer of dusty debris. The comet is reseeding back to the icy depths of space. Not all comets produce an Earthly meteor shower. Only those that intersect our planet’s path will cause a display of comet dust striking our atmosphere at 59 km/sec about 100 km above us. Chick Little nor we, will not have to worry about anything falling on us. So here we have our eight night observing window with a wide range of stellar objects to view. So what is out there to observe? It so happens that this area of celestial real estate has a lot of ‘favourites’ to hunt down and enjoy. Such as the most beautiful double star in the entire sky – Albireo. Located at the head of Cygnus the Swan that glides against the background Milky Way, this wonderful pair of distant suns lies some 380 light years (ly) away. The two components are widely separated and will take literally thousands of years to orbit each other. 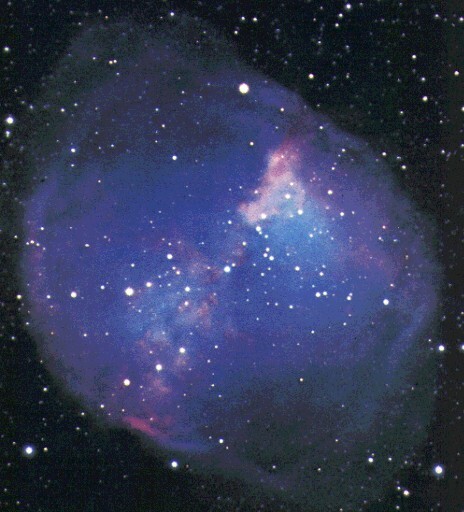 Moving a little more than eight degrees to the southeast, we come across the planetary nebula M27. AKA the Dumbbell, the first impression you will see is that of a half eaten apple. The dead star resides in the center and this is a preview as to what the Sun will look like when it runs out of fuel and dies in about five billion years. It is fairly close to us at some 1,200 ly and is about a fifth the wide of the full moon. Skipping over to Sagitta the Arrow is the globular cluster M71. Although it is classified as a globular cluster, I have the impression of a well populated open cluster. Any way you put it we know that it is sitting at an estimated 1,300 ly away, and shines at a decent magnitude 8.5. 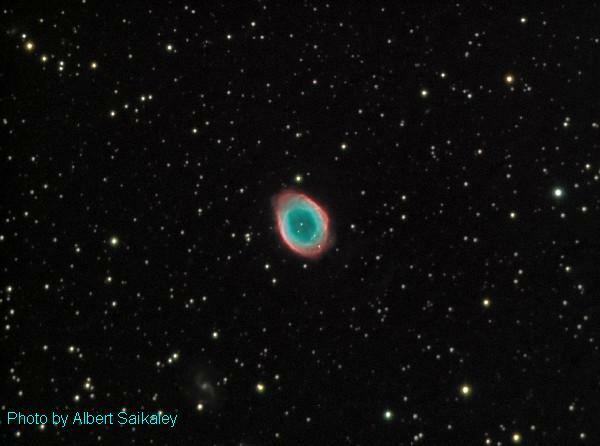 Another planetary nebulae not to be missed is M57 – the Ring Nebula. Centered between the lower two stars of Lyra’s rectangle this planetary is a 9.5 magnitude. Very large telescopes will allow you to visually see the parent star (14th magnitude) at the middle of ring but CCD camera makes it a cinch. The ring is caused as the dying star that has used up its own fuel, first grows to giant size as it is starving. When the star balloons out to hundreds of millions of kilometers and in our case around the orbit of Mars, gravity cannot hold its outer edges and material gracefully float away to usually form a ball of gas. A great optical test is the Tim Horton’s star (the double-double). You will easily see a double star in a finder scope some one and three quarter degrees to the east of the very bright star Vega in the constellation Lyra the Harp. Looking at this 160 ly system at low power in the telescope, you get the sensation that these stars are not pin-point sources. Bumping up the power you not begin to split each star in separate components hence two double stars. The better the collimation of the telescope’s mirrors, the clearer the tiny separations. A good challenge for a medium size scope as well as testing sky transparency is to hunt down the very wide Veil Nebula. This every growing and dissipating shell of star stuff is the last remains a supernova – a star that exploded some 15,000 years ago. What a sight that must have been as the 1,400 ly distant star quickly brightened to magnitude minus eight or the brightness of the crescent moon. All is left are two giant arcs of gas, three degrees apart with the western section passing through the star 52 Cyngi. Using an OIII filter will help trace the subtle detail of its structure. 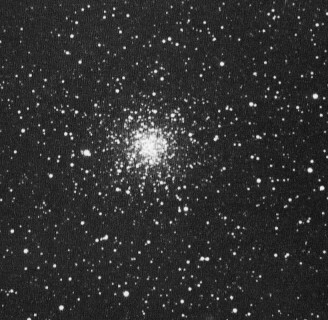 The globular cluster M56 is a dim cluster but still observable. Lying some 32,000 ly from us, it has as estimated width of 85 ly. Only the inner portion is visible and even the core is not as condensed as other globulars. 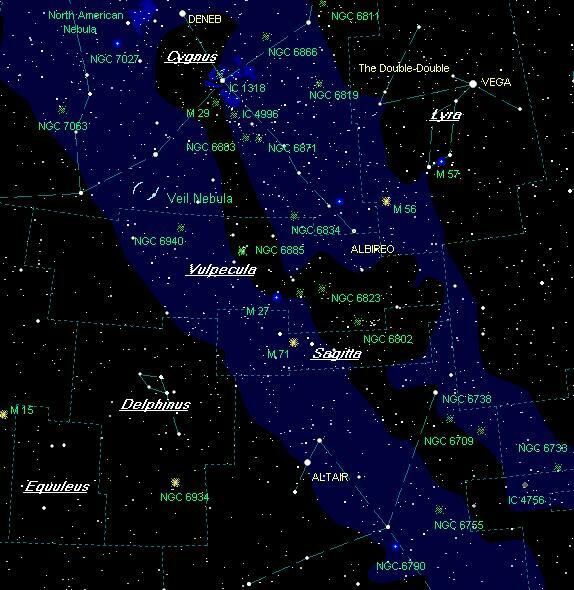 You can find M 56 half was between Alberio and Gamma Lyrae. Move back up the long neck of Cygnus and along the gorgeous Milky Way till you reach Gamma Cygni at the intersection of the wings and the body. Surrounding this spectral class F8 sun are numerous gaseous regions catalogued as IC 1318 or the Butterfly Nebula. Although we have seen a few objects that require a telescope to enjoy, nothing can replace the scanning of the Milky Way with low powered binoculars. Literally hundreds of distant suns fill the eyepiece at any given time as your brain drinks in photons. I have spent many a night simply with wide angle 7 X 35 binos, a lawn chair, red flash light and a good star chart, out in the countryside. In fact you will see most the objects mentioned in this column but to a much smaller degree. While on the topic of binoculars, our last object is best viewed with a wide field, this is the North American Nebula together with the Pelican Nebula. With an area of almost four moons wide, a telescope will not grab the entire gas cloud. Catalogued as NGC 7000, the North American has an uncanny resemblance to our continent. Residing about 1,600 ly from us this Nebula has star forming regions. A total of three open clusters numbered NGC 6989, NGC 6996 and NGC 6997 have grown from this stellar nursery. The King of planets – Jupiter owns the southern skies. Shining with majestic grandeur, Jupiter shares the sky with the orangey star Antares, the heart of the Scorpion found directly below. As the weeks march on into autumn, follow Jupiter’s movements with respect to this sun. The planet itself is a collection of dark bands and white zones. The Great Red Spot (more of a dull pink) is seen each time the planet rotates in just less than ten hours. But the showpiece of viewing Jupiter is its four main moons. As the hours main moons swing around its giant parent, we see slight changes in position. At times these satellites cross the face a Jupiter and cast lovely shadows on the Jovian cloud tops. Consult the 2007 Observer’s Handbook for a list of events. RA:20h 22m 30.1s Dec:+40d 16' 28"
RA:20h 16m 48.6s Dec:+37d 39' 25"
RA:21h 30m 23.6s Dec:+12d 12' 02"
RA:20h 24m 12.5s Dec:+38d 33' 29"
RA:19h 16m 55.4s Dec:+30d 11' 50"
RA:18h 53m 36.0s Dec:+33d 02' 00"
RA:19h 54m 9.9s Dec:+18d 48' 12"
RA:18h 51m 53.1s Dec:+10d 21' 33"
RA:19h 43m 27.0s Dec:+23d 19' 06"
RA:19h 01m 46.9s Dec:+11d 36' 39"
RA:19h 08m 12.3s Dec:+04d 14' 43"
RA:19h 23m 36.8s Dec:+01d 31' 53"
RA:19h 30m 57.5s Dec:+20d 16' 58"
RA:19h 38m 27.4s Dec:+46d 35' 03"
RA:19h 41m 35.3s Dec:+40d 12' 05"
RA:20h 03m 58.7s Dec:+44d 01' 18"
RA:20h 06m 12.7s Dec:+35d 48' 19"
RA:20h 11m 36.9s Dec:+35d 52' 22"
RA:20h 12m 20.8s Dec:+26d 30' 23"
RA:19h 52m 32.0s Dec:+29d 26' 12"
RA:20h 34m 56.7s Dec:+28d 19' 35"
RA:20h 58m 37.4s Dec:+44d 30' 03"
RA:21h 07m 24.7s Dec:+42d 15' 49"
RA:21h 24m 44.2s Dec:+36d 31' 57"
RA:20h 46m 2.4s Dec:+30d 44' 41"
RA:20h 56m 44.5s Dec:+31d 44' 45"
Yes it’s that time of year when the Mars email hoaxes begin to surface. Description such as “Mars will be as big as the Moon” are completely false. I believe the false statements sprung up in time for the August 27, 2003 close approach. Such bogus emails also came up in 2005 and again this year. Even the dates are wrong. In 2005 Mars was closest on October 30 and this year the closest approach to Earth will be on Dec 18th and it gets its brightest on Christmas Eve. Just keep in mind the red planet and Earth are closest about every 26 months.The Red planet is the brightest object in the eastern skies around 1:00 a.m. over the next few months, follow its quick path and ever increasing brighness. Looking ahead to next month there is a potential for a rare meteor storm from the Alpha Aurigids on September 1st. The shower is a product of Comet Kiess which was last spotted back in 1911, one year after Halley. It will be a long time till Earth sees this mountain of ice as its orbit is estimated to be about 2,500 years. Comet Kiess seems to deposit dense trail of debris along its path. Earth has had glancing blows in 1935, 1986 and 1994. However this year, it is believed that Earth will pass very close to the centre of a dust tail. It appears those who live on the west coast of North America, Alaska and Hawaii will get to see the possible outburst. Keep watching the skies.